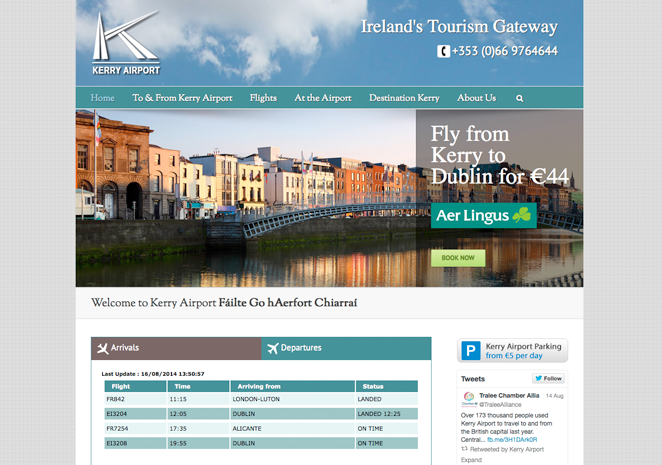 Kerry Airport is a regional airport centrally located in the heart of County Kerry in the spectacular southwest of Ireland. Kerry Airport currently offers scheduled direct flights to Dublin, London-Stansted, London-Luton and Frankfurt-Hahn with additional flights to Alicante and Faro during the summer months. © 2018 Kerrynet Solutions - All rights reserved. Registered In Ireland No. 424338. VAT No. IE9575606c.